If you like Snickerdoodles you MUST. TRY. THESE. NOW!!! Seriously, one of the best cupcakes I've ever had. They were moist, buttery, sugary and cinnamony. Yes, I realize cinnamony is not a word but these were so good I just don't care! The recipe, from Martha Stewart's cupcake book, suggests pairing with her Seven-Minute Frosting, however I paired with a Vanilla Bean Buttercream. 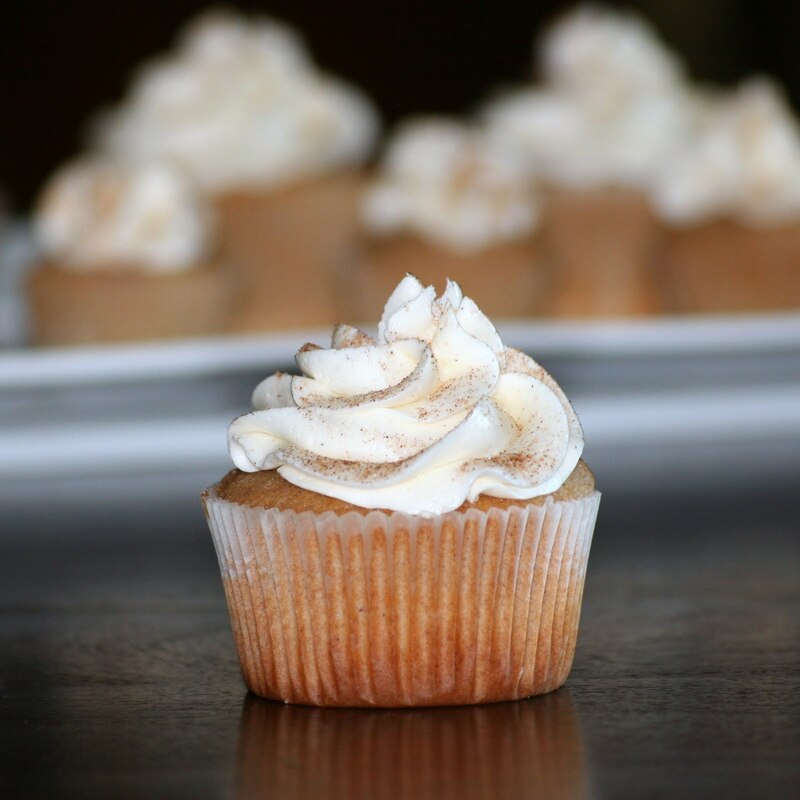 Top with cinnamon and sugar for a spicy sweet finishing touch. If I'd have had a little extra time I would have made mini Snickerdoodles for a cute little garnish, but alas, time just was not on my side. Preheat oven to 350 degrees and prepare cupcake pans with liners. Sift together flours, baking powder, salt and cinnamon. Set aside. In the bowl of an electric mixer on medium-high speed, cream together the butter and sugar until pale and fluffy. Add the eggs, one at a time, beating until each is incorporated and scraping down sides of bowl as needed. Beat in the vanilla. Reduce the mixer speed to low and add the flour mixture in three batches, alternating with the milk, beginning and ending with the flour. Beat until combined. Fill your prepared cupcake pans 3/4 full. Bake, rotating halfway through, until a cake tester inserted into the center comes out clean, about 20 minutes. Transfer cupcakes to a wire rack to cool completely before frosting. Those are so cute! The cupcakes look great! Those look great! 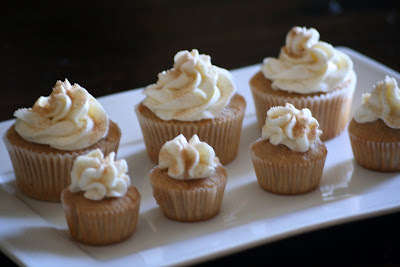 I'm sure snickerdoodle cupcakes are amazing. Those look so good! Do you have the frosting recipe? And what kind of milk do you use? Skim? or Whole? Beth - I actually used 1% milk because that's what I always have on hand. I'm sure a higher fat milk would produce richer results but they were great with 1%. As for the frosting - I'm actually going to post it later this week or next week. Check back soon! Hey Telly, I just saw this on F.G. Looks good! I think cinnamony is a perfect word!! I love snickerdoodles and these look even better than the cookie! I love snicker doodle cookies but as a cupcake? It must be amazing! Oh, this sounds like heaven. I love snickerdoodles, and can't wait to try them as cupcakes. Speaking of snickerdoodles, do you have a favorite recipe? I like a chewy snickerdoodle! Newlywed - here is my favorite recipe. They're soft and chewy, with a bit of bite around the edges.